The following article is courtesy of www.paisley.org.uk and Pro-Life Fitness Centre. Pro-Life is sponsoring the men?s 3rd 4th and 5th X1 and the ladies 2nd and 3rd X1 and has just supplied the club with some 200 warm-up tops. As part of the deal Kelburne members also get help with their fitness regimes and nutritional plans as well as preferential rates on membership. First team player and sponsorship convener Iain Schofield said: ?Pro-Life Fitness Centre and Kelburne?s relationship goes back many years and this season sees them supporting a number of teams within Kelburne. ?The Men?s 3rd, 4th, 5th XI teams are a mixture of older players and young developing talent. Similarly the Ladies 2nd and 3rd XI squads have a strong mix of youth and experience which we encourage at the club. ?So it is fantastic that Pro-Life are backing us again in such a generous manner. Without this type of support we could not offer the people of Paisley and elsewhere in Renfrewshire what we do just now. We are a community club and just like Pro-Life we treat all our members as family.? He added: ?Pro-Life has been good to us over the years and we hope this relationship goes on for a long time to come.? Gayle Brannigan, CEO of RSC, said: ?Pro-Life?s bond with Kelburne goes back a long way and we are delighted to be sponsoring the five squads for another year. As well as providing the tops our teamof experts are on hand to help with fitness plans and nutritional advice. ?When RSC was launched we pledged to use the profits to boost funds to our two hospices ? ACCORD and St Vincent?s ? but also to support Renfrewshire?s rising sports stars and that?s what we are doing here. Both clubs are doing their bit by supporting the local community and I am delighted to carry on our long association with Kelburne.? The latest sponsorship award from Pro-Life comes hot on the heels of a new deal with the Paisley Pirates. Annual Christmas night out. We know it's still early but at Kelburne we like to be organised. In partnership with Pro-Life Fitness Centre the sponsors of our Ladies 2?s & 3?s and Gents 3, 4 & 5?s , we will hold the Club Night out at the function suite on Saturday 6th December at 7pm. The cost is only £5 per ticket and includes a DJ, buffet and party games, there will be drinks promotions for those over 18 and soft drinks for under 18?s. It is open to everyone in the Club of all ages including Parents who want to show the youngsters how it is done on the dance floor. Tickets will be available soon from your Team Captains or Catherine McLauchlan or Douglas McEwan. PARENTS NOTICE FOR THOSE WHO ATTENDED INDOOR SESSION AT LAGOON ON TUES 21 OCT. Please see email below from the Facility Duty Manager at the Lagoon. Can you all please double check to see if this was picked up by mistake. If found can you please contact Catherine direct to let her know and arrange to drop of ASAP. Can you ask about to see if anyone has picked up a head mic from the arena bymistake. We can't find it anywhere and it sits on the staging in the indoor hall. In accordance with the age group requirements for West District and Scottish Hockey competitions, the indoor training schedule which had an error in the stated qualification "year" in the age group information, has been changed as appropriate. ThisSaturday's coffee morning at the club will the last one until after the new year. As always, all donations of cakes/biscuits etc would be most welcome on the day. Remember - Halloween Party Tickets will be on sale. On Saturday 18th October Kelburne Ladies 2's hosted Grange Ladies 2's at Glasgow Green. With the Kelburne team looking for some much needed points to help their league position. The first half witnessed a pleasing display of possession hockey from the Paisley team, who's average age was notably in the teens. Nevertheless they went into half time 0-0 after failing to convert 3 corners and capitalise on their dominance. The second half begun in a similar fashion, with the defence transitioning the ball confidently to keep the Edinburgh team chasing shadows. In the 47th minute some lovely play down the right saw Jen Morgan stepping up to play a searching pass into the D. After the keeper cleared this pass Olivia Cain followed up to slot one passed the keeper and open the scoring. A tough battle was fought for the remainder of the game, however the Kelburne Ladies 2's remained focused and claimed the three points. Kelburne Ladies 2's travelled to Millerston on Sunday to face Strathclyde University in the Championship league. On a extremely wet and windy day Paisley girls fielded a strong young squad of sixteen players. From early in the game the Kelburne 2's maintained possessions and controlled the game in the middle of the park. They opened the scoring in the 20th minute following a corner which was slipped left. Catherine McLaughlin calmly found the bottom right corner. A string of attacks followed this with both Maryka Cain and Marlieke Rademakers looking lively upfront. In the 25th minute the score doubled when Tegan MacPherson coolly converted a straight strike from a corner. At half time the score was 2-0 to the visitors. The second half begun as the 1st ended, with the Kelburne girls maintaining lengthily periods of possession. The defence played very high up the pitch with Zoe Irvine and Briony Coyle creating lot of depth to their attack. Imogen Davies and Jen Morgan edged further up the pitch and supported attacks. It was only a matter of time before another goal came and again it came from a corner. MacPherson showed her composure once more, to slot home another in the bottom left. Nevertheless within eight minutes,following a momentary loss of concentration, the Strathclyde University ladies pulled one back with 15 minutes remaining. Eilidh Fleming in goals was left exposed after a forward pass carved through the defence to find their high forward. Kelburne's answer was to create a corner straight away following a penetrating run from Anna McIntosh and Erin Cain. Olivia Cain was once more denied by the post on this occasion and another corner followed. On this occasion Ellise Berry's shot was stopped by a foot on the line and a flick was awarded. However the keeper pulled off a spectacular save to deny Berry on this occasion. The Kelburne team were not done there. Lexi Sabotelli individually maintained possession in the D and found space to slot the ball pass the keeper on her reverse. Final score was Strathclyde 1- 4 Kelburne 2's. Thomson Cycles Kelburne this week hosted Inverleith in what was anticipated to be their toughest test of the season so far. With regulars Fraser Hutchison and Steven McKinnon unavailable due to work commitments, the team welcomed back Gordon Menzies to fulfil their roster. After dominating the opening stages of the match it was Inverleith that drew first blood when Kelburne failed to clear their lines and Fergus Barrows? clearing kick rebounded off Captain Ewan Carmichael?s leg and into the empty goal. Not long after the restart Kelburne were back on even terms when set piece expert Scott Sutherland flicked the ball high into the net leaving the keeper with no chance. Minutes later Sutherland got his second, again from a penalty corner, this time going low to the keeper?s right. With half time approaching Kelburne were fortunate to get a third when Gordon Menzies? speculative pass deflected off the defender?s stick and straight to Andrew Bremner who gratefully tapped home. A quick half time team talk, highlighting areas to improve and exploit, the team restarted determined to build on a sold first half. Ten minutes into the second half Kelburne?s fourth came when JG Shepherd?s cross pass was deflected by the Inverleith defender into his own net. Not long after Sutherland completed his hat-trick again from a penalty corner, this time the keeper getting a touch on it but injuring himself in the process. Unfortunately this resulted in the keeper leaving the pitch. Kelburne sensed this was an opportunity to score more goals. Minutes later after good work down the baseline by Andrew Bremner his pass found Sutherland who slammed home Kelburne?s sixth. The seventh shortly followed again from Sutherland and his trusty drag flick, this time high into the goal leaving the defence with no chance. Andrew Bremner got his second of the game with another tap in after good play from Andrew Duff. The final goal of the game came with JG Shepherd skipping past the defender and crossing to leave Bremner to slot home Kelburne?s ninth. A good performance against difficult opposition leaves Kelburne top of the league, two points clear with a game in hand. Thomson Cycles Kelburne travel across town next week to play local rivals Hillhead in a top verses bottom of the table clash. The game got underway with pushback being taken by Glasgow Uni. The first fifteen minutes of play was fairly even, open play with neither team creating scoring chances. Shortly after coming on as a sub Lucas Farndale went on a solo run from left midfield and played a nice ball through to Jak O'Connell who saw his first time effort slide just past the post. Minutes later Farndale went on another solo run and this time the ball fell to Finn Halliday who struck the post. After twenty four minutes the first short corner of the game was won by Kelburne after even more great play from Farndale. The short corner was injected by Ian "Bambi" McIntyre stopped by Halliday for O'Conell to shoot at goal but he fooled the Uni team and played a nicely weighted pass to McIntyre at the back post who failed to make connection with the ball and the chance passed. This brought out the comment from spectator Neil McIntyre who said " whoever that player was at the back post should be subbed and dropped from the team for missing such a sitter". More open play by both teams followed with David Ogilvie in goal having to dive to his right to pull off a great save and keep the score even. Kelburne did manage to win another short corner but again the ball did not find the backboard. Just before halftime the Uni team broke quickly from their own half and caught the Kelburne team napping and scored. Kelburne stared the second half with great belief that this game was still in their hands, that they had played good hockey in the first half and didn't deserve to be losing. They knew that if they continued to play in the same way they would achieve a positive outcome. Unfortunately the first five minutes were all Glasgow Uni and saves from David Ogilvie in goal kept the score the same. During this period the Uni team won several short corners but failed to convert any. Kelburne began to slowly claw their way back into this game and won a few short corners but did not score. Fraser Hutchison did have a wonderful solo effort saved by the keeper and this seemed to drive the team forward looking for that equalising goal. That goal finally came from the stick of O'Connell from the third short corner the team won in a row, each being perfectly injected by Halliday. The midfield were constantly driving forward trying to find openings but unfortunately could not make that break through the Uni defence. A fair result as both teams played good open hockey. A thank you to Adam McInnes who ran the bench and led the halftime team talk. The highly anticipated Kelburne 3's V Kelburne 4's took place on Saturday at Glasgow Green Hockey Centre. Both squads were depleted due to the holiday week and injuries. Kelburne 4's had 3 fifth team players plus stand in keeper Jack O,Connell and welcomed back David Magee from injury. The 3's started strongly and in the first half they pressed hard from the start but all their efforts were dealt with by the defence and some great saves from stand in keeper O'Connell. The 4' s won several short corners but failed to convert with 3's keeper Dougie McEwan making 3 great saves. Second half saw the 4's push out more with the 3's counter attacking but again falling short on shots at goal. Stand in keeper O'Connell again saving well when called upon. A breakout from defence saw some quick accurate passing out to young Finn Halliday in the circle and he calmly slotted the ball past keeper McEwan to give the 4's the lead. Minutes later the young striker repeated the feat to put Kelburne 4's up by 2 goals to nil. The big upset looked on the cards but Kelburne 3's responded with a well worked goal of their own This rallied them and the equalising goal game a couple of minutes later 2-2. Both teams now played on for the match winner but the final score remained 2-2. As I'm sure you know the Men's 1st team captured the National League Division 1 title for the 10th year in a row in March. To mark this incredible achievement the club are hosting a celebration dinner and are keen to recognise all who have made a contribution to the success over the last decade. This event is open to all club members young and old and so far we have a large number of people attending who not only played a major role in 10 in a row, but also members of the Burne team who were successful in the 90?s. The club also plan to recognise the equally outstanding feat of the Men's 2nd team also winning 10 in a row in the Central League over the same time period. Date: Saturday November 22nd 7.30pm start. Tickets are going fast and at present we have around 50 tickets available. Should you wish to reserve a ticket or have any questions please email Mark Fulton or social@kelburne.com . The deadline for purchasing tickets is Monday, November 17th at 6pm. More information including menu and details of the payment process will be available early next week. Due to the number of senior fixtures being played this Sunday (19th Oct), we have insufficient coaches available to deliver the scheduled girls youth development squad session at Linwood and it will have to be cancelled. An additional session will be arranged at a later date to cover this. Apologies for any disappointment or inconvenience this may cause. As you know hockey cannot take place without umpires. It is still the aim of the club that every senior member is a qualified umpire, most of you think you know the rules anyway. The following event is coming up and if you are not yet qualified, we would encourage you to make the effort to attend. If you are going along please let me know and I can confirm to the organisers and you can potentially car share to the event. The theory test paper and rules can be found in the Useful Documents section of the website. As part of Kelburne's initiative to improve all round organisation of the club and its junior section, the attached guidelines / procedures for attending events such as training sessions and fixtures have been adopted to suit conditions of our health and safetyrequirements. They are not designed to deliberately inconvenience parents / designated guardians, but no doubt it may feel this way until they become a regular habit. Kelburne take very seriously, their Duty of Care towards their young members and as such must ensure they provide as far as possible, suitable safety measures for all. Thomson's Cycles Kelburne travelled through to Edinburgh for a late afternoon start against the team who last year had a decisive say in last year's title race. The late start had had a prohibitive effect on the availability of players, so Kelburne welcomed back the well travelled Ross McPherson and Mark Connor. Things could've been worse for the Paisley side, from another short corner Fraser Scott was able to divert a goal bound shot around the post, to keep the deficit at one. Play resumed in much the same manner, the Paisley side pushing the students deep into their half, eventually forcing an equaliser from a set piece move. A free hit was won outside the 25, and Fraser Hutchison recognising the situation hit the ball straight into the 'D' and Andrew Bremner was able to deflect the ball past the goalkeeper. 1-1, just before half time. During the interval patience and perseverance were promoted,alongside a reshuffle, as the evening start, and late notice period, claimed another player leaving Kelburne with the bare eleven for the second half. The calm and considered approach began to pay off for Kelburne, the backline of Connor Bain, Scott, Adam McInnes, and Harry Godfrey retaining the ball with quick ball pace around the back, and dealing with any breakaways. The midfield trio of McPherson, Fraser Hutchison and Ewan Carmichael were taking advantage of the high ball pace provided for them, to pull Edinburgh Uni about, and createchances for the eager forward line of Bremner, Steven "SAM"McKinnon and Connor. At this stage Kelburne were looking comfortable, able to invite the Edinburgh side out and look to hit on the break, with a number of unbelievable saves and poor decision making keeping the score down. Unfortunately, this profligacy was to come back and haunt Kelburne, as young defender McInnes was forced off with a pulled hamstring, leaving the side a man short for the final 15 minutes. Edinburgh Uni 3s were encouraged by this, and pressed forward with the game becoming increasingly fractious as both sides incurred a number of cards resulting, in a further numerical imbalance. Uni were able to force home a second despite the best efforts of Barrows leading to a nail biting final 5 minutes. Another goal line clearance from Scott, and several superb saves from Barrows ensured the game finished with a victory for Kelburne 2s, leaving them top of the league with a game in hand. Thomson's Cycles Kelburne 2s will attempt to continue their winning streak, with a full squad, on Saturday the 18th as they welcome Inverleith 2s to Glasgow Green at 15.00. The development squad travelled to the dunes of Cambusdoon, Ayr to play a team who were playing National league 3 last season. It was a big ask and with Miles Goldie coming to help this brought the number of adult players to three this week. The game started with Finn Halliday taking the push back. The ball was lost and Ayr drove forward in numbers and their first shot at goal ended with the ball striking the back board. Try as they might there was just not let up for the young Kelburne team but they never gave up and battled for every ball, unfortunately the score at halftime was Kelburne Pro-Life Fitness 5s 0 Ayr 1s 8. Ayr did have a player carried off and taken to hospital from an innocent looking challenge. The second half was much like the first with wave after wave of attack from Ayr who looked to be taking delight in racking up a high score against such a young team. Kelburne youngsters are made of stern stuff and never once let their heads go down and tried to take the game to Ayr with some lovely passing and running and twice Niall Taylor came close to scoring. The youngsters did finally find the back of the net from the stick of Jonny Hughes scoring on his senior debut. The young team can take so much from this game. They never gave up, they fought for each other, encouraged each other and they played good hockey. We heard that the player taken to hospital suffered from a split kneecap we wish him a speedy and full recovery. 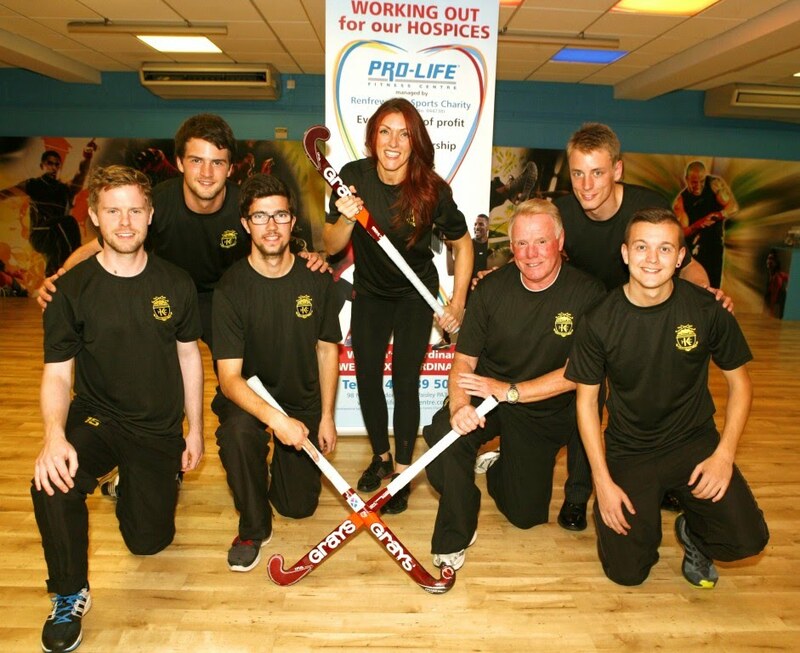 Pro-Life Fitness Kelburne surrendered their unbeaten record in a very disappointing result against Hillhead. Coming off the back of their clinical performance last week, Kelburne 3XI hosted Uddingston 3XI on pitch 1 of Glasgow Green. The developing Kelburne side got off to a great start to the match, pressing their opposition high up the park when off the ball and working hard for each other when in possession. This positive start lead to not one, not two, but THREE early goals inside the first 7 minutes for the home side with all of the goals being finished in fine fashion by club veteran Billy Anderson. It was clear that Billy wouldn't accept an easy finish after flicking his first high into the open net from all of one foot before the line. This Uddingston side clearly hadn't turned up and looked in complete shock as to what was happening. The day was only to get worse for them when Fraser Bone got on the end of a cross and calmly slotted past the away keeper. In between the Kelburne onslaught of goals, the away side did show some fight and were trying to get some outcomes on the break, but a strong Kelburne defence stood in their way and cleared up the danger with great composure shown from Captain Stuart Robin, sweeper Gordon Robbie and the returning Alan Ralph. Before half time there was time for a goal from each side, with Kelburne's coming from a positive passing move and being finished off again by Billy Anderson. The second half continued in much the same manner as the first, with Kelburne controlling most of the play and earning multiple short corners. It was with one of these short corners that the home side would improve their lead further, with the combination of a Billy Anderson injection and a Steven Robbie stick stop, Davie Fowler was able to drag flick the ball past the helpless Uddingston goal keeper. Other than a few fast counter attacks from the away side, the rest of the game was played out with the Kelburne side happy to hang on to their lead by holding possession and creating chances when the space was there to take advantage of. There was still time before the final whistle, however, for a Gordon Robbie green card. There were plenty of positives to take from this game and the team's performance certainly showed that they are ready to put up a fight for the West District Division 1 league title. Next for this improving Kelburne side is Irvine 1XI away from home on Saturday 11th October. Stepps were the quicker team out of the starting blocks and had Pro-Life Fitness Kelburne on the back foot and may have opened the scoring on the first attack if it was not for the quick action of Ogilvie in goals who pulled off a fine save. The team began to find their feet and pass the ball around from the back into the channels trying to advance up the pitch towards the Stepps goal but were losing the ball in midfield. On one occasion the ball was quickly pushed to the Stepps forward who won a short corner which they failed to convert. Stepps scored after nine minutes and this was mainly due to having the defence under pressure which lead to a mistake and the ball was crashed home. Stepps were awarded another short corner which again they failed to convert. Pro-Life Fitness Kelburne began to come more and more into this game and young Finn Halliday scored his first senior goal with a quick shot as he entered the D which caught the Stepps defence napping. The possession for the next few minutes were equally shared with neither team creating goal scoring chances. On the twenty minute mark Stepps were given a penalty flick which was disputed by the team but Ogilvie yet again made a brilliant save. As the clock counted down to halftime it did not look like either team would score and typically, as is the case, Stepps did manage to find a way through the defence and the ball finished behind the helpless Ogilvie. The second half stared more brightly with Kelburne winning a short corner after three minutes but the shot was saved by the keeper and bounced to safety. Stepps then began to look the better team and created more scoring chances. In the eighth and twelfth minutes they scored two quick fire goals. The young Kelburne team were not finished yet and they dug deep and fought hard for the ball and each other and soon began to turn the tide. Finn Halliday collected a long ball out of defence from Macpherson and went on a drive to the base line as recently taught at training. When he went to pull the ball back to top D he noticed there was no support so calmly slotted the ball past the keeper from tight on the base line. This spurred the team on and they drove hard at the Stepps defence looking for another goal and on the thirty second minute they got that goal. From an infringement Farndale fired a quick ball into the D while the other team were trying to organise themselves and this ball ran through to Fraser Whiting at the back post who slotted the ball under the keeper for his first senior goal. The remaining minutes of the game were played out in the middle of the park with neither team creating a scoring opportunity. Considering this week?s team only had one adult it was a good performance from the youngsters. It is nice to see they are beginning to take what they are learning at training to the game on a Saturday. I must say Stepps also had a team made up of mainly youngsters but did have more adults which seemed to make a difference however it was nice to see youth have a chance. Further to our indoor training survey and coaches meeting on Friday night, please find below schedule of group training for these events. All players must attend their relevant age group sessions, with no exceptions, unless by advice from club coaches.